Pieces of excellent grafiti artists, critique of Israel, declarations of love and even the menues of nearby restaurants: A stroll along the wall in Bethlehem not only reveals one of the strongest symbols of the conflict and displays the local and international responses it also gives you the chance to stop for a random chat with a local worker, another traveller or a visiting artist. The chance to get some insights into the Palestinian soul and a glimpse of the daily life under occupation makes the wall to one of the most interesting sites in Bethlehem. Much more interesting than the overcrowded Church of the Nativity or the other touristic sites, visited by organized group tours, bringing people for a few hours with extanded souvenir shopping to Bethlehem. 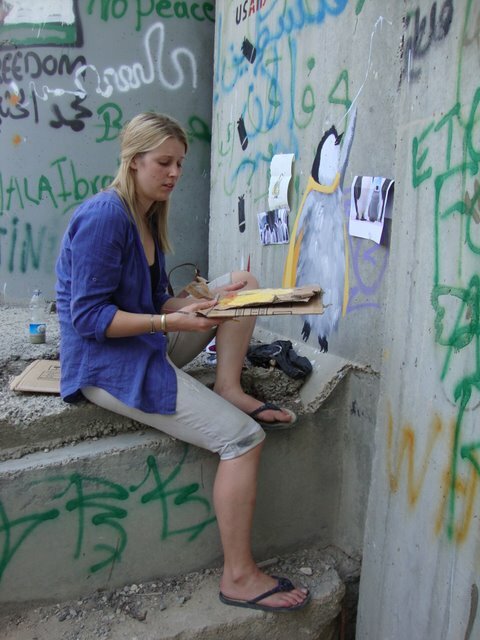 Rosie, the UK grafic designer, came to visit friends in Bethlehem and used the chance to leave her own art on the wall. The penguins she draws are dressed in superman like suits and are jumping or flying over the barrier. “There is this saying”, she answered asked why she decided to draw this specie. “‘If god had intended you to fly, he would have given you wings.’ And this reminds me a lot of the situation and the people here.” With this she is pointing around and to the wall where she put here painting on. Actually the officially called separation barrier consists by 90% of bard or razor wired fences, with vehicle barriers and exclusion areas. Only in some more high security areas like Bethlehem the Israeli authorities put up the 8m tall wall with watchtower, refered to in a lot of grafittis as the new “Berlin Wall”. Israel started to construct the separation barrier in 2003, following a Palestinian violence outbreak. The construction activities are currently put on a hault because the government run out of money. Already about 750km or 60% of the final length have been finished. Undisputed the number of suicide bombers or other Palestinian attacks declined dramatically since the begin of the constrution. But the construction of the barrier is mainly critized for not following the green line, the official border between Israel and the West Bank. In fact the barrier is reaching in several areas between 200m and 2km into Palestinian land and by this effectivly annexing 9% of the West Bank. The United Nations estimate that if the barrier is completed about 274.000 Palestinians will live in enclaves behind the wall. Alone in Bethlehem the completed barrier will annex about 64 sqare km of the cities most fertile land to Israel and about 22.000 Palestinians from Bethlehem will strand on the western side of the barrier. The old Hebron Rd. that usually led directly into Jerusalem is now already cut off by the wall and an army checkpoint. Checkpoint 300 is the main one in the area, crossed by about 2.100 Palestinians a day, communiting to Israel for work. Just around the corner you will find pieces of the UK grafitti artist Bansky as well as pieces in the style of the famous Palestinian cartoonist Naji Al-Ala. Naji Al-Ala became famous for his character “Handala”, a boy always drawn from the back. In Naji Al-Ala’s own words “Handala was born ten years old, and he will always be ten years old. At that age, I left my homeland, and when he returns, Handala will still be ten, and then he will start growing up. The laws of nature do not apply to him … Things will become normal again when the homeland returns. Al-Ali was assasinated in 1987 in London by until now unknown killers. Some of the famous grafittis are actually put on the wall that is built around Rachels Tomb, holy site for Jews, Christians and Muslims as well. Currently no Palestinians are allowed to visit the site and also for international tourists it became very complicate. At the same time, strolling around you’ll find peope just trying to live a normal life: Three friends hanging out in front of a gas station, laughing and chatting; two boys riding their bikes up and down the hill in front of an army gate; finally the sounds of drums that led me to Aida refugee camp, home for about 3.200 refugees from 1948-49, where I found a youth scout drum group practising in a not yet finished building for a performance. These glimpses of a normal daily life to reflect the meaning behind Rosies artwork. She decided to paint superman like dressed Penguins jumping or flying over the wall to leave a symbol of hope and inspiration. Even when there seems to be no way and boundaries prevent from moving, the Penguins seem to say, never give up, we will find a way to go beyond. Thank you for writing this — I found it on Twitter. One important correction, however: on the wall there is lot of art in the *style* of Naji Al-Ala, but he himself did not paint them on the wall. He was assassinated by the Israelis long before the Wall was erected.